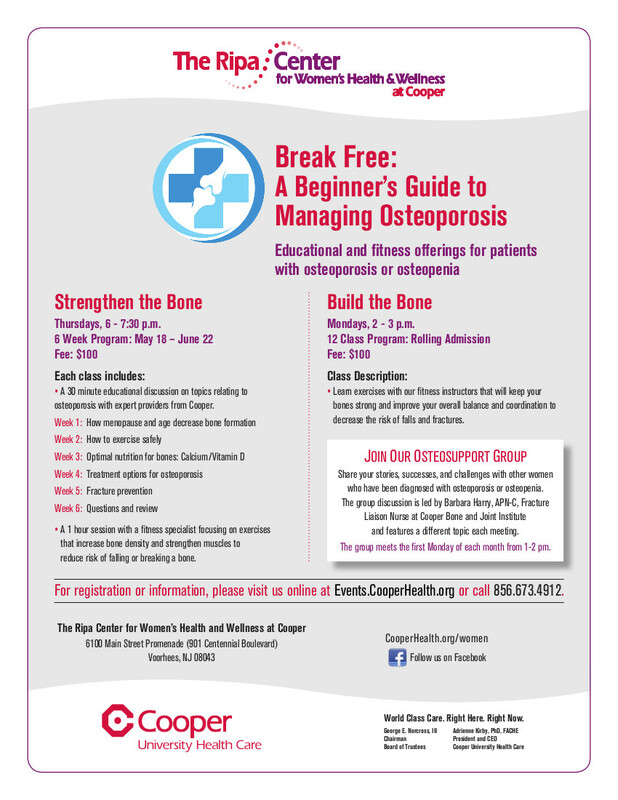 Thursdays, 6 – 7:30 p.m.
Each class includes a 30 minute educational discussion on topics relating to osteoporosis with expert providers from Cooper and a 1 hour session with a fitness specialist focusing on exercises that increase bone density and strengthen muscles to reduce risk of falling or breaking a bone. Learn exercises with our fitness instructors that will keep your bones strong and improve your overall balance and coordination to decrease the risk of falls and fractures. Click to see upcoming sessions. Share your stories, successes, and challenges with other women who have been diagnosed with osteoporosis or osteopenia. The group discussion is led by Barbara Harry, APN-C, Fracture Liaison Nurse at Cooper Bone and Joint Institute and features a different topic each meeting. The group meets the first Monday of each month from 1-2 pm. For registration or information, please visit us online at Events.CooperHealth.org or call 856.673.4912. Copyright © 2019 The Source.